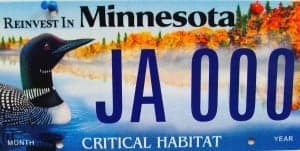 PROOF OF INSURANCE IS NOW REQUIRED BY THE STATE OF MINNESOTA WHEN RENEWING LICENSE PLATE TABS AND REGISTERING A NEW VEHICLE. Please write in the name of the insurance company, policy number, and expiration date on your renewal slip. If you do not have your slip please bring in your insurance card. The written tests can be taken at City Hall on the 4th Thursday of each month (except for November) from 9:00 a.m. to 11:00 a.m. and requires no appointment. Manuals to study for the tests can be found online at http://dvs.dps.mn.gov or purchased in our office at $5.00 each for vehicles or motorcycles and $8.00 for CDL manuals. New residents must change their license within 60 days after moving to Minnesota from another state (a written test must be taken) or 30 days after a change of address within the state.